Either you are a Back-end Web developer or a Front-end one, you must have realized that there are some frameworks and tools that have gained the poll position in Web application development. Which are these? Go ahead, search and download a client-side library, plugin or package. It’s 100% percentage sure, that you will be prompted to run one of the following commands. So what exactly is NPM? NPM is the Node.js Package Manager. In other words, NPM is to Node.js what Nuget Package Manager is to Visual Studio. And what is a Package Manager? A Package Manager is responsible to automate the installation and tracking of external packages. It can locate an online package, select and install a specific version. In order to install NPM you need to install Node.js so go ahead to its official website and install it here. After installing Node.js type the following command in console and ensure that you have NPM installed as well. Install Gulp globally by typing the following command in console. through NPM by typing the following command in console. here. If you need to use an external library such as angularJS then you have to install-download the respective Typescript Definition File. Typescript Definition files have the extension .d.ts and describe the types defined in an external library. They are only used during development, not in deployment. You can find such files in a specific repository named DefinitelyTyped here. You can download and use a specific Typescript Definition file using the Typescript Definition Manager (yup.. another package manager..). This package manager locates and installs d.ts directly from the DefinitelyTyped repository. Install it by typing the following command in console. There are many attributes that you can set in this .json file but we will only use the dependencies value to download the required libraries. Let’s start by installing angularJS. Change the bower.json as follow. Notice that by the time you start typing the dependency you want to download, you have auto-complete intellisense experience. This helps a lot tracking the required dependency. 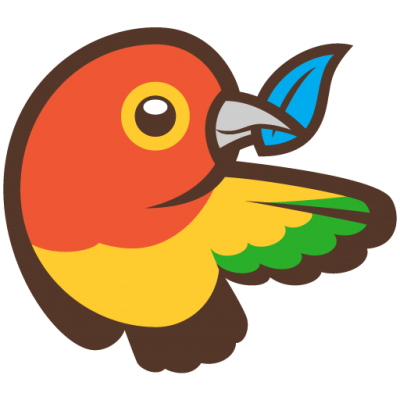 When you save the bower.json file the magic will happen. 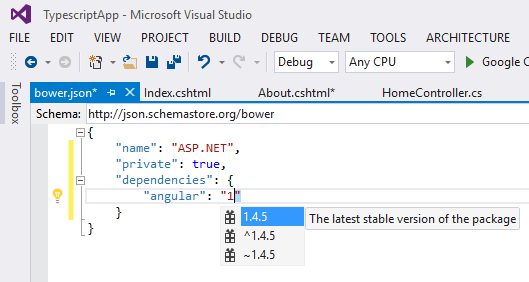 Visual Studio will download angularJS files. You will notice that VS downloads the dependencies in a root/lib directory by default. This directory is defined in the .bowerrc file. Now, if you are already familiar with Bower you would know that by default the depenencies are downloaded in a bower_components directory. The truth is that I’m kind of used with that behavior so go ahead and change the .bowerrc file as follow. The command will update the bower.json file by adding the required dependency. 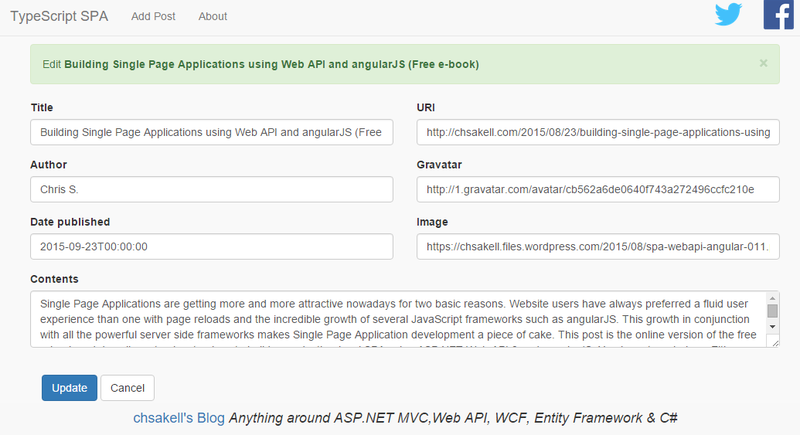 It will also download the angular-route module inside the bower_components folder. Let’s see the complete bower.json file. Make sure you save the file and download all the required dependencies. Create an app folder in the root of your application and add inside it our first TypeScript file, named app.ts. Because of the fact app.ts is the first TypeScript file we added, Visual Studio will inform us that the project has been configured to support TypeScript and will suggest to search for typings from the Nuget package manager. Press NO, we will do it ourselves after we understand why we need to install them. At the moment, if you try to create an angular module will will notice that TypeScript does not recognize the word angular and that’s because TypeScript doesn’t recognize external library types without their respective .d.ts files. Hence, since we haven’t installed the required TypeScript Definition Files for angularJS, angular is an unknown word to TypeScript. You have two choices here. Either install those files using Nuget Package Manager which will download those files inside a Scripts/typings folder or use the Typescript Definition Manager we installed in previous step, and type the following command in the console, while at the root of the application. Notice that this time we don’t use the npm command but tsd in order to ask TypeScript Definition Manager to install the TypeScript Definition Files for angular. 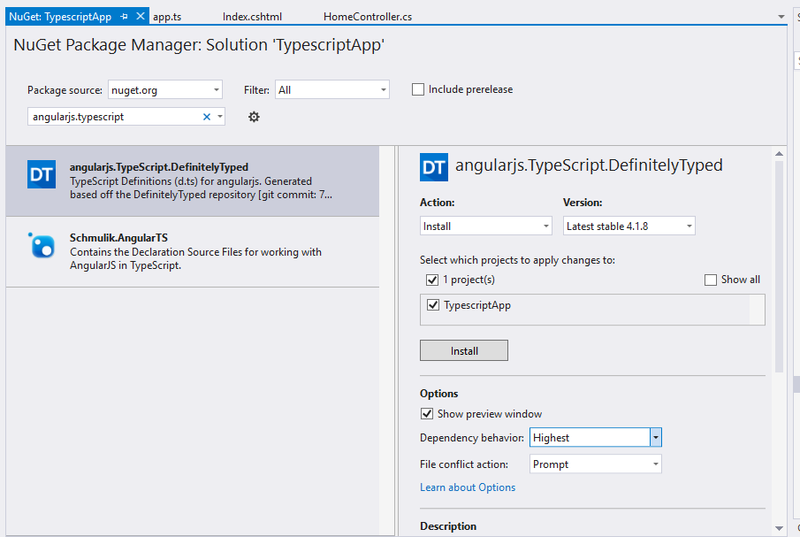 By passing –resolve and –save as parameters, TypeScript Definition Manager will resolve any dependencies that the angular definition files require and download them as well. The –save parameter will save the result in a tsd.d.ts file. 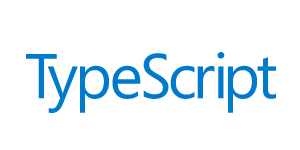 This file contains the references path so that TypeScript can find the .d.ts files. Personally, I always prefer to install the TypeScript Definition Files using Nuget cause I have noticed some intellisense issues with the first one. Open Nuget Package Manager, search the term angularjs.typescript and install the respective package. This will also install jQuery relative TypeScript Definition Files since angular’s d.ts is depended on it (if prompted to install jQuery d.ts files click OK). After installing the packages make sure the typings have been added in a Scripts/typings folder and TypeScript now recognizes angular. We will proceed with defining our main angularJS module inside the app.ts TypeScript file. One important thing to remember when coding with TypeScript and angularJS is to always encapsulate your code in TypeScript modules. You will see that we are going to use Interfaces, Classes and many variables through our application and TypeScript modules will help us to encapsulate all of theses since TypeScript module can only access code within the same TypeScript module by default. In order to access an Interface or Class that belongs to a different TypeScript module you need to expose it using the export keyword. TypeScript module defines a unique namespace and since in angularJS is good practice to structure the spa by feature, guess what: we can also define a unique TypeScript module that actually encapsulates the angularJS components for a specific feature. In our application (which is quite small), we will define a top level module, the main module which we can call it app. For common services or directives we will have the TypeScript modules app.common.services and app.common.directives respectively. We only need to display, edit and add Posts in this application so we can create the relative TypeScript modules, app.PostList, app.PostEdit and app.PostAdd. Let’s proceed by defining the Post domain entity that we are going to use through the app. Add a domain folder under app and create the following TypeScript file named IEntity.ts. We will enforce all of our domain objects to extend the app.domain.EntityBase class. We encapsulated the code in a new TypeScript module named app.domain and we declared an interface and a class that are going to be available outside this module, because we used the export keyword. Add the Post.ts file inside the app/domain folder as well. By implementing an interface we force a class to define certain properties or functions. In the Post class, we used public properties in the constructor which automatically creates the relative properties. We will see different pattern on the controller classes. You may have noticed that a TypeScript module can split among different files. Let’s create the first service now. Create a new folder named common under app and add a new folder named services under common. Add the following constantService.ts TypeScript file. We created the ConstantService to define any constant api URIs to use across our application. You can see that we chose to create the property outside the constructor and that we only exposed the actual service, not the interface. The next would be to create a dataService able to communicate with a Web API backend infrastructure but since we haven’t create the latter yet, let’s do it now. Add the Post.cs file inside the Models folder. Contents = "Dependency injection is a software design pattern that implements inversion of control for resolving dependencies and is highly recommended for building scalable, testable and maintainable applications. In this very blog we have seen many times this pattern, mostly in ASP.NET MVC and ASP.NET Web API related posts where for example dependencies (data repositories or middle services) were injected into MVC constructors. We haven’t seen this pattern though in applications using the Windows Communication Framework. I decided to write this post cause I believe there many interesting things to cover when it comes to “marry” Dependency Injection and WCF. " Contents = "Unit testing can be beneficial to many aspects in software develepment, from the lowest level that is the source code to the highest level and the end user’s experience. Writing automated tests helps finding defects earlier in the development lifecycle process which leads to fewer late nights or weekend work (happier developers). Since defects are resolved before production, less defects reach end users (happier clients). It also increases reliability of source code, since if the base code doesn’t change all tests should always return the same results. Last but not least, anyone that decides to write unit tests is also forced to write testable code which leads to better software development practices." Contents = "OData is an open standard protocol allowing the creation and consumption of queryable and interoperable RESTful APIs. It was initiated by Microsoft and it’s mostly known to .NET Developers from WCF Data Services. There are many other server platforms supporting OData services such as Node.js, PHP, Java and SQL Server Reporting Services. More over, Web API also supports OData and this post will show you how to integrate those two." Contents = "Choosing the right architecture for Web Applications is a must, especially for large scale ones. Using the default Visual Studio ASP.NET MVC Web Application project templates, adding controllers with Scaffolding options, just to bootstrap your application and create pages and data in just a few minutes, sounds awesome for sure, but let’s be honest it’s not always the right choise. Peeking all the default options, keeping business, data and presentation logic in the same project will impact several factors in your solutions, such as scalability, usability or testability. In this post, will see how to keep things clean, creating a highly loosely coupled ASP.NET MVC Solution, where Data Access, Business and Presentation layers are defined in the right manner. " Create the Web API controller named PostsController. The controller implements the basic CRUD operations to be invoked from the anguralJS services. Let’s switch back to the front-end and create an angularJS service able to communicate with the server by sending HTTP requests. Add the following dataService.tsTypeScript file inside the common/services folder. An interface declares the functionality you want to expose through the class that implements it. On purpose, I haven’t pasted all the code yet so that we can focus on the most important parts first. First thing to notice is that app.domain.EntityBase TypeScript class is accessible because we used the export keyword. The DataService is being injected with two familiar (I hope) services, $http and $q using the relative TypeScript Definitions ng.IHttpService and ng.IQService respectively. Here we can see for the first time the static injection pattern above the constructor declaration. We will follow this pattern in our controllers as well. Let’s see the full service implementation now. As we mentioned, our SPA has only one feature, the Posts, so go ahead and add a new folder named posts under the app. As opposed from the app.ts the controller that displays the posts is named postsCtrl. Add the following TypeScript app/posts/postsCtrl.ts file. Here we can see how we injected our custom services constantService and dataService to make the API calls. Any property you need to be exposed through your controller needs to be declared in the interface being implemented. Here we expose a posts property and a remove method. Let’s view the postAddCtrl controller. Create the following file inside the app/posts folder as well. The only new thing to notice here is the way we declared the success callback method we invoke after the post is submitted. We know that on success, we expect a result of type app.domain.IPost and hence we used it. I left the postEditCtrl controller last because it makes uses of an interesting service, the ng.route.IRouteParamsService. The controller needs this service in order to catch the parameter id when we routing to /edit/:id. When you drag a TypeScript file inside an html page, Visual Studio will adds the corresponding JavasScript transpiled file. If you wish you can build and run your application to check how it looks like. Is that possible? Of course it is, Gulp makes those type of tasks a piece of cake. To start with, add a gulpfile.js file at the root of your Web application. 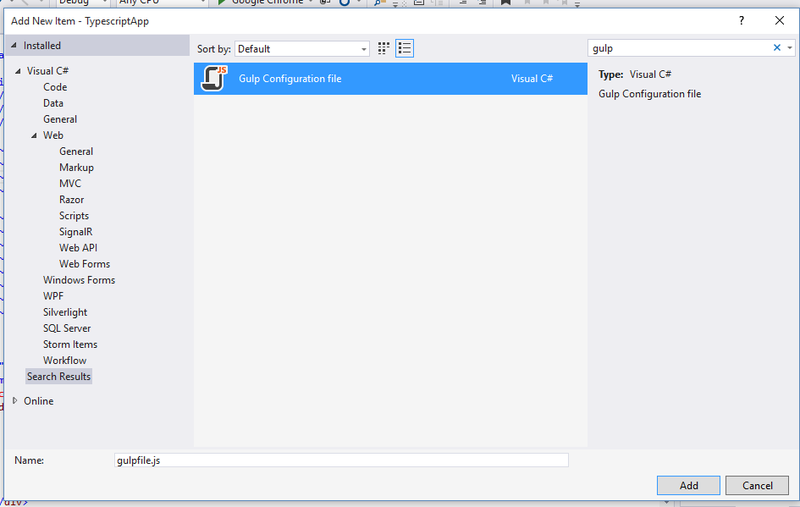 In Visual Studio 2015, you can do it by adding a Gulp Configuration file. Here’s how the default gulpfile.js looks like. This file in the main entry point for defining Gulp tasks and using Gulp plugins. We need to install Gulp before actually run a Gulp task so how we do it? 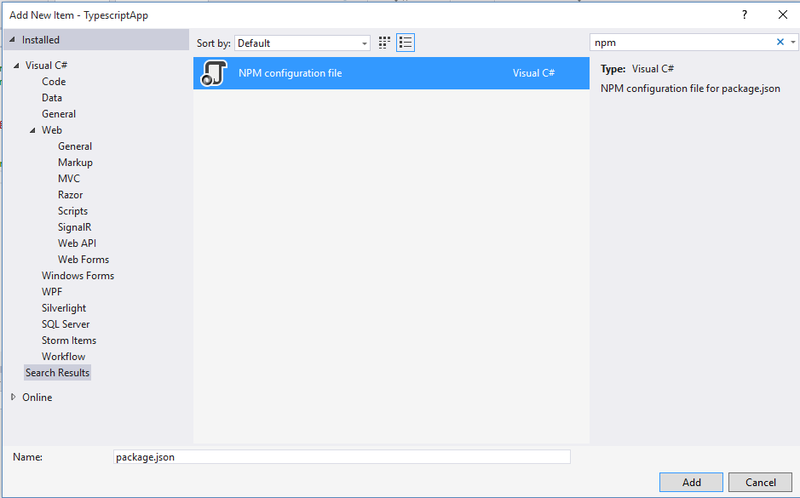 Using NPM through Visual Studio. In the same way you created the gulpfile.js add a new NPM configuration file at the root of your application. By the time you save the file, VS will download Gulp inside a node_modules/gulp folder. 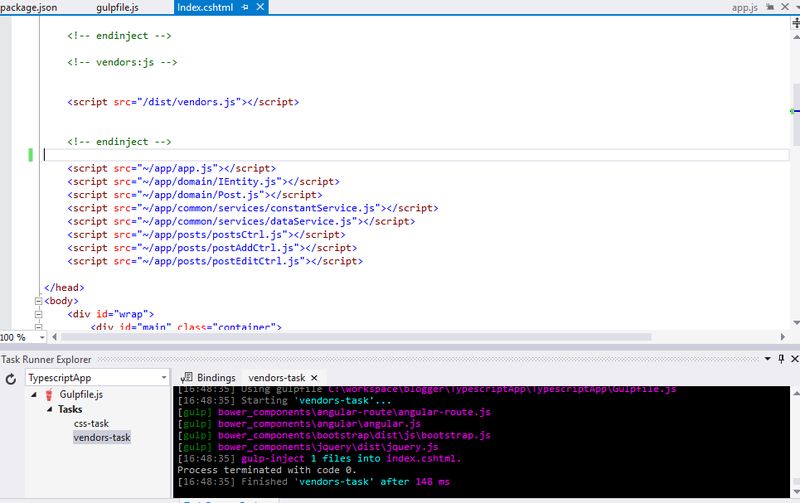 Just to make sure Gulp has been setup correctly change the gulpfile.js file as follow and run the task through the Task Runner Explorer. In case you wanted to run the default task outside Visual Studio you could type the following command in console, in the same way we did with NPM. Both of those commands assume that you have NPM and Gulp installed as we described at the beginning of this post. We didn’t say anything about how Gulp works but we will after we create the first task. The first task is going to process the CSS files and finally inject the resulted file in the Index.cshtml page. Let’s view the task. I should have highlighted all the lines cause they all require explanations. First of all we create references to the Gulp-plugins that we are going to use. Those plugins must be installed via NPM as well (I will show you the updated package.json later). 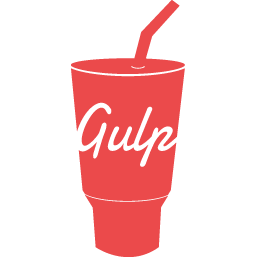 You create a task using the gulp.task API passing the name of the task and a function which defines what you want the task to do. You use the gulp.src API to define the source files to be contained into the stream. Here we used the bootstrap and the custom css file for our SPA. Next we created the actuall task to be executed. Despite the fact that it seems that the inject command is the first on the pipeline, what’s is inside it comes first. Hence, first we get the css files from the customCssStream and we print them. I added the printing so that you can see that you are processing the right files. Then we concatenate those two files by using the concat Gulp-plugin. The parameter declares the resulted file name. Next, we copy the appStyles.css file inside a .build/css folder using the gulp.dest command. 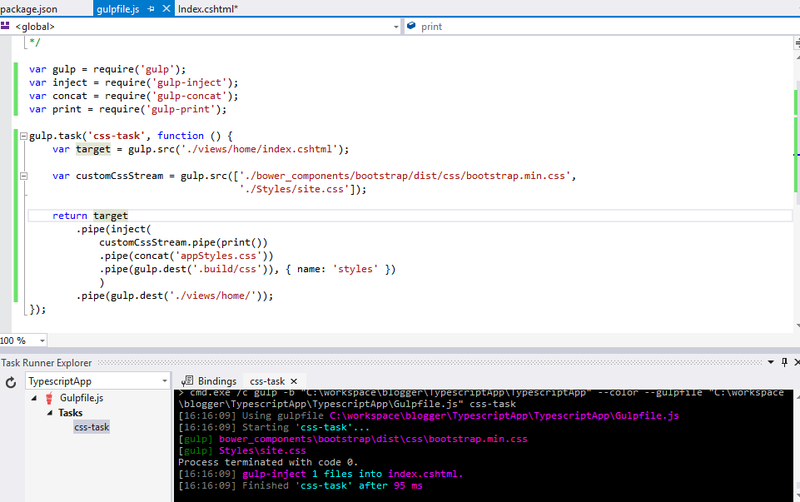 Finally the resulted file is being injected into a region named styles that we defined in our Views/Home/Index.cshtml page, using the inject Gulp-plugin. For all this to work, first you need to install the required plugins using NPM. Of course, you can remove the CSS references we manually added before. Let’s proceed with the vendor’s Gulp task. When coding in angularJS it’s very important to inject files in the right order. This is why we used a Gulp plugin named gulp-angular-filesort. In case you didn’t noticed, on purpose I declared the stream files in wrong order. Comment out the line that sorts the files and your application will break. Moreover, if you wish to see the order that Gulp injects the files, simply comment out the concatenate action. Now let’s see the changes in the package.json and Index.cshtml. That’s it, we finally finished! We have seen so many interesting things on this post but make no mistake: we have only scratched their surface. There are amazing things you can accomplish using those tools and I totally recommend you to study their APIs and plugins. I believe that now you shouldn’t have any problem to kick of any project that has used Bower, Gulp and NPM. You can download the project we built from here. 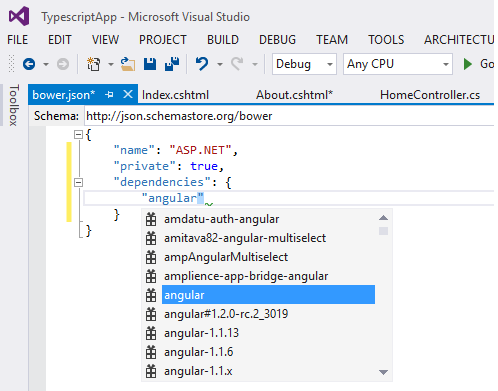 When you open the solution for the first time in Visual Studio 2015, it will automatically detect and install any Bower and NPM dependencies. Build the solution to restore Nuget Packages and run the app! Very good tutorial! Big thanks! Oh wow, this is great! Do you mind sharing your experience on best practice about maintaining an user session state between angular and web api? Thanks and keep up the good work. I have been compiling numerous articles while setting up a new Visual Studio 2015 MVC 6. If I had come across this article before I began my search, I could have stopped here. 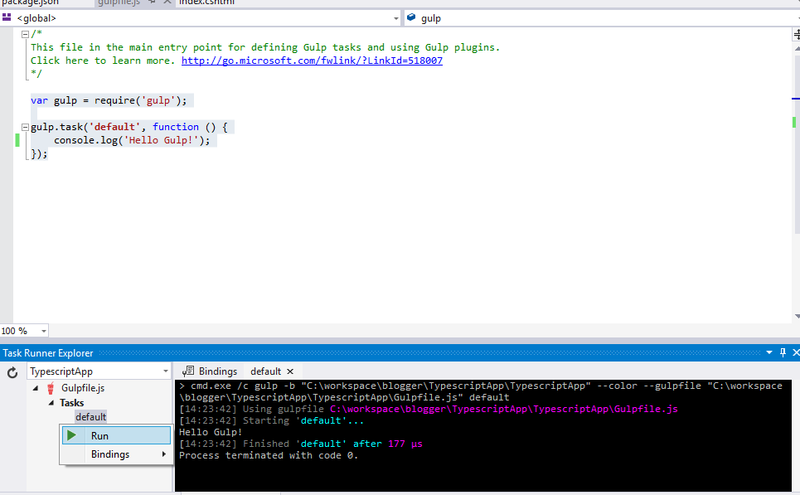 After installing the packages jquery.typescript.definition etc Scripts/typings is empty, why? If this happened try to manually re-installed the TypeScript Definition files using NuGet Package Manager. Delete the Typings folder (if exists) under Scripts. This time install jquery.TypeScript.DefinitelyTyped package first and then the angularjs.TypeScript.DefinitelyTyped, though the former is a dependency. That solved the problem for me. you mention the console many times but what are you talking about the nu-get package manager console or the windows powershell console????? 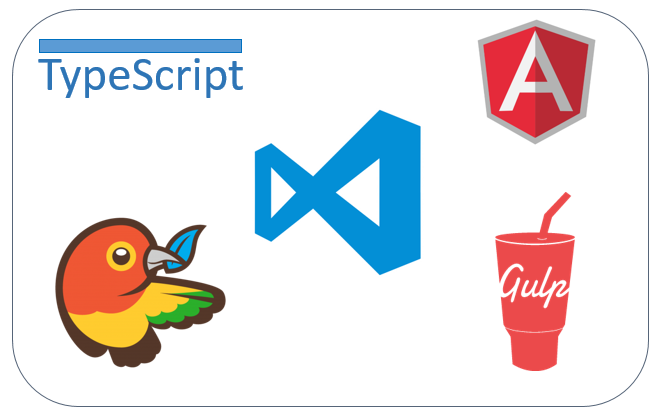 This is an excellent article for both how to use NPM/Gulp/etc with .Net 4.6 as well as with TypeScript project setup. I’ve been using TypeScript for years and have not found such a useful tutorial about getting your .Net project bootstrapped with all the require files and components. I know this article was meant to be about Gulp, but as a 101 resource for getting started with TypeScript this is great. I think you could even create a version of this article without the Gulp and client package stuff just to help people get started with TypeScript. Angular is great, but there aren’t enough TypeScript examples out there. As for the Gulp and NPM stuff: I love the ease of client package management with bower and gulp is great for replacing the .Net optimization stuff. I started trying to port my app to .Net 5 just to get these features, but wish I hadn’t because it’s still too far from ready. I had been looking for an article like this, about getting the bower/gulp experience in a 4.6 app, but couldn’t find one. So, thanks heaps man, you’ve written a great article here and it’s been super helpful to me, even with experience with TypeScript. when i applying this tutorial step by step that i was get an error on bower.json step. and vs 2015 try to install available angular version. but i get an error message this time. Where did I go wrong ? Install git command line tool. Thank you for this fantastic post. I’m following this from the very first. I have implemented all the steps before “Entering Gulp” point. But when I build the application, I get the 223 errors in angular.d.ts and jquery.d.ts file. FYI, This is what in my bower.json file. Please, help me, how can I get rid of these errors. This is common error when your Visual Studio TypeScript is out of date. Try to update it from here and re-open the solution. Excelent tutorial!! Nice sample, Thanks a lot! But how do we debug as we develop? A long time looking for a good tutorial. which version of nodejs and npm have you used please?